c. 1956 A view of the Brixton street market along Electric Avenue, taken from the elevated platform of Brixton railway station (on Atlantic Road). 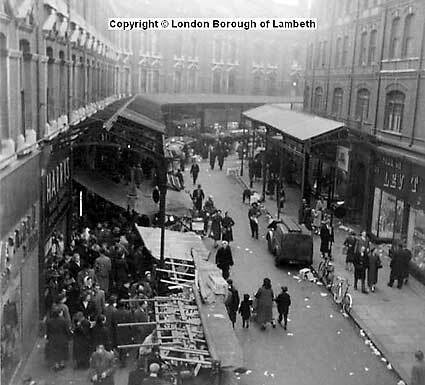 Note the ramshackle market stalls along the left hand side of the street and the state of disrepair of the canopy above. 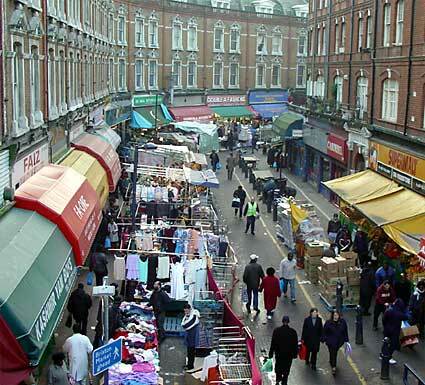 Dec 2003 Fifty years on and the market continues to be the bustling heart of Brixton. The elegant iron canopies have been replaced by brightly coloured plastic awnings proclaiming an array of eclectic range of food stores including, 'Kashmir Yam Boys', 'FA-One', 'Kashmir Halal' and 'Sea Breeze Fisheries'.